‘New Babylon’, Apart from the standard version, other versions were requested. 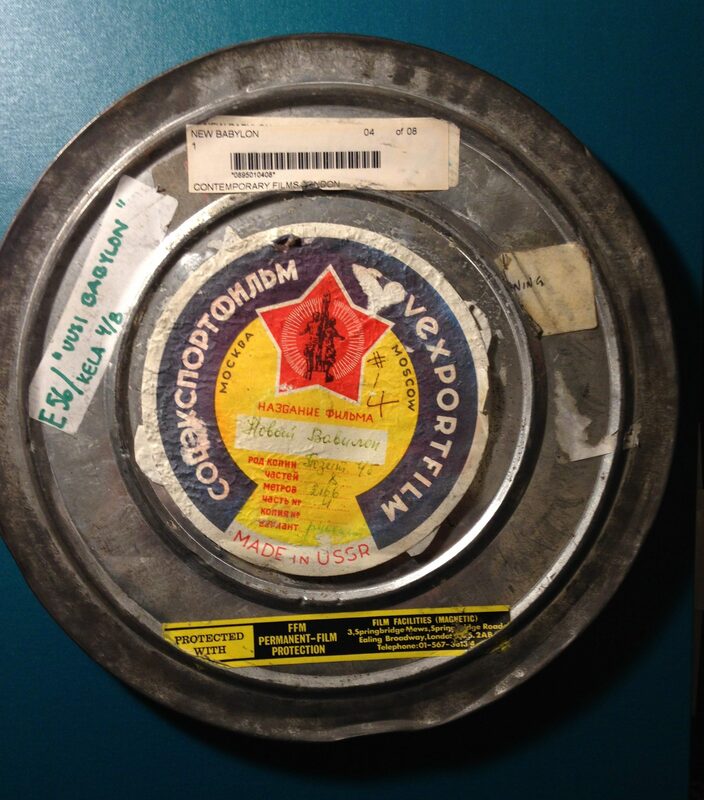 In 1999 (July) Cineteca Bologna asked to use the ‘Export’ version. At the other extreme, in June 2009 Opera North asked for another version which combined the ‘Lenfilm’ and the ‘Export’ versions put together by Marek Pytel, but neither was really definitive. During the 1999 / 2000 period Mark conducted the ‘Lenfilm’ version with various orchestras:- 19th March 2000, Frankfurt RSO at the ‘Alte Oper’. At short notice he was called to replace a conductor for the Kassel Staat Theatre performance (28th October 1999) who fell ill. The same conductor had to withdraw from another performance the following year, which Mark also took over at the invitation of Kyoko Edo (Seiji Ozawa’s first wife), giving the first performance in Japan on 1st July 2000 to open the Tokyo Summer Festival with the Tokyo Philharmonic Orchestra at the Bunkamara Concert Hall (where Mark had already conducted in 1995). 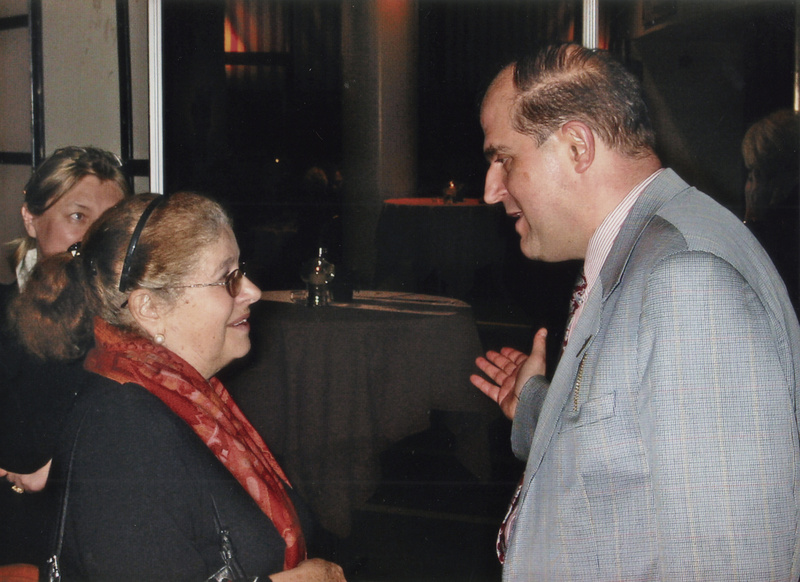 Theodore van Houten arranged for Mark to conduct performances of ‘New Babylon’ at the Rotterdam Gergiev Festival with the Rotterdam Young Philharmonic (all pupils of, and extras with the main Rotterdam Philharmonic Orchestra) in September 2001. This was a very significant period for several reasons and related to Theodore’s ambitious plans for Mark. 2001: the Strasbourg Orchestra (and Mark) travelled by plane on 4th September to Wrocław for their performance of ‘King Roger’ at the Cantan Festival. The orchestra’s return to Strasbourg was on the 11th September. Mark had to leave Wrocław for Rotterdam on 9th September for his ‘New Babylon’ performances at the Gergiev Festival, the rehearsals starting on 10th September. It was a rewarding surprise to discover that the composer’s son, Maxim Shostakovich, was staying at the same hotel. He spoke to Mark about his own difficulties trying to fit the ‘New Babylon’ score with the film (‘very difficult’ was his conclusion). During the rehearsal break on the afternoon of 11th September, turning on the TV as several colleagues did, it took some time to understand that what we were seeing was not a film but live reports of the New York Twin Tower terrorist attacks – a very disturbing experience for all. The next morning’s rehearsal started with a two minute silence in honour of the victims. For the opening night (13th September) Gergiev had arranged for his Marinski Orchestra to come and augment the Rotterdam Philharmonic for a performance of Shostakovich’s gigantic Fourth Symphony. Gergiev had been conducting in America just before his Festival but all the USA flights had to be cancelled from 11th September. Flights from Mexico to Europe were not much affected. Despite travelling to Mexico for a flight back to Rotterdam, Gergiev was unable to get there in time for the first night of his Festival. Maxim Shostakovich (also a conductor) was the obvious choice to take his place. His performance of his father’s Fourth Symphony was outstanding and seemed to be untouched by the New York events. Gergiev was back in time for his performance of the Sixth Symphony on the 18th September which gave Mark a chance to meet him. John Riley (film music expert) and Simon McBurney (actor, and brother of Gerard, both of them Shostakovich experts), also attended the Festival and spent much time in discussion with Mark, particularly about achieving a definitive version of ‘New Babylon’. For the Gergiev Festival Theodore had also arranged the screening of several rarely seen films from the 1930s with Shostakovich’s music. He particularly drew Mark’s attention to the film ‘Odna’ (‘Alone’). Originally planned as a silent film in 1931 it was one of the first attempts by the Soviets to try to fit a soundtrack to a film. In many sections Shostakovich added an extra brass group to an already large orchestra to be certain that these first attempts at recordings for a film soundtrack would be effective. As it was conceived as a silent film, the soundtrack only has a few sound effects and almost no dialogue. The surviving sound track had already deteriorated and fades into complete silence quite often. The sixth reel (out of the eight) has been lost, although the score for that section exists. Theodore’s main reason for showing the film to Mark was to have the whole score fully reconstructed for both live performance and re-recording the well-played, but crudely and inadequately recorded original soundtrack. Mark set to work on it as soon as he returned to London. On checking Volume 41 of the old ‘complete’ edition with the soundtrack of the film there were at least 15 items missing which could not be found anywhere. A few items were re-used by the composer, either rescored or transposed (not so hard to reconstruct) but there were several important sections for which the score was considered lost. There was no choice but to recreate these sections by ear (with great help from Jonathan Del Mar). Nick Raine (composer as well as orchestrator of some of Carl Davis’s film scores) also did his best to help us. One of the fully orchestrated virtuoso items was so fast that even two bars could take as long as two to three weeks to reconstruct. The finale of the film defeated us all………. but rescue was soon to come. Theodore van Houten arranged with Mark to take the restored work (in progress) to the Polish composer Krzysztof Meyer and his wife Danuta Gwizdalanka at their home in Altenkirchen (near Cologne) for help and advice on 16th March 2002. Krzysztof is not only a great composer himself but had worked and studied with Shostakovich as well as writing his biography. The Meyer household was touchingly friendly and hospitable. On starting to look through Mark’s progress so far, another unexpected lady entered the room. Mark was introduced to Mrs Irina Antonovna Shostakovich, the composer’s third (and most compassionate) wife, who looked after the composer for the last 13 years of his life. Mark had brought a tape of a few sections which had been impossible to sort out, in particular the great finale. As soon as the item was started, both Irina and Krzysztof gave a stunned look at each other and almost in unison said ‘We have just published this!’ Shostakovich had taken it directly from the ‘Odna’ manuscript to be used as an overture to the ballet ‘The Limpid Stream’. Mrs Shostakovich arranged for a full score and set of parts to be sent to Mark as soon as possible from Moscow. It was the essential final link to achieve a full restoration of the score of this work which was published by DSCH in 2004 as Volume 123 of a new complete edition of the composer’s works. Theodore and Irina Shostakovich arranged 3 performances for Mark to conduct with the film in 2003, all of which were sold out, using the orchestra of the Amsterdam Conservatoire. The world première (the first Shostakovich world premiere for over 20 years) was on 13th April at Theater aan de Parade, den Bosch (attended with great joy and gratitude by Irina and her staff), followed by 15th April Vredenburg, Utrecht and 16th April at the Sorbonne, Paris attended not only by Irina but many other Shostakovich fans, including Krzysztof Meyer and the French composer, Betsy Jolas, who gave Mark many flattering compliments after the performance. Gijs Elsen (manager at the Barbican Concert Hall, London) contacted Mark straightaway after the French première to find a way for the work to have its British premiere at the Barbican with the BBC Symphony Orchestra. The earliest date they could find was 10th February 2006 – a wise date to choose, as it was the composer’s 100th birthday year and attracted extra attention. Gijs took great trouble to arrange the best artists available for this performance. Celia Sheen was the obvious and perfect choice for theremin soloist, (famous for her solo in the ‘Midsomer Murders’ theme tune), the BBC Singers also engaged for the brief but important ‘Ostansja!’ chorus, the overtone throat singer Mark von Tongeren (who had already taken part in the first performances), Larisa Gergieva, (sister of Valery) was asked to select the soprano, mezzo-soprano and tenor soloists from her Marinsky Academy of Young Singers in St Petersburg. It was decided that it would be more practical for Mark to travel to St Petersburg (16th to 20th November 2005) and rehearse them at the Marinsky Theatre. All this was organised by Askonas Holt. This trip was more than valuable. Staying at the Europa Hotel had the advantage of being right next to the St Petersburg Philharmonic Hall which Mark also visited. Galina Retrovskaya (library manager at the time, as well as previously personal librarian to Mravinski) and her staff gave Mark a full tour of the hall, which included a display concerning the ‘Leningrad’ Symphony first performance in their hall, as well as tickets for the orchestra’s concert that evening (Prokofiev and Mahler). The experience proved conclusively how the orchestra’s seating was arranged (in particular first violins left and second violins right), also confirmed by videos of Marinksky’s rehearsals of Shostakovich’s Fifth Symphony attended by the composer. Mark was also put in contact with Vladimir Gurevich (Chief of the St Petersburg branch of the Composers’ Union as well as a close acquaintance of Shostakovich). In the area of Nevsky Prospect Mark was shown all the cinemas where the first performances of ‘New Babylon’ took place (except for the ‘Silver Screen’ cinema which was being converted for another use). The other cinemas and their small orchestra pits proved that the ‘New Babylon’ music could only have been conceived for a salon orchestra with solo strings in mind. Vladimir showed Mark the apartments where Shostakovich had lived in his early career as a silent film pianist, also explaining his daily schedule which consisted of playing for morning sessions at one cinema, leaving himself just enough time to walk home for lunch before continuing to another cinema for the rest of the day. The British première of ‘Odna’ at the Barbican was a great success with very rewarding consequences. Apart from BBC radio interviews – Petroc Trelawny (‘Music Matters’) and Sean Raffety (‘In Tune’), there was much newspaper and music magazine interest shown. 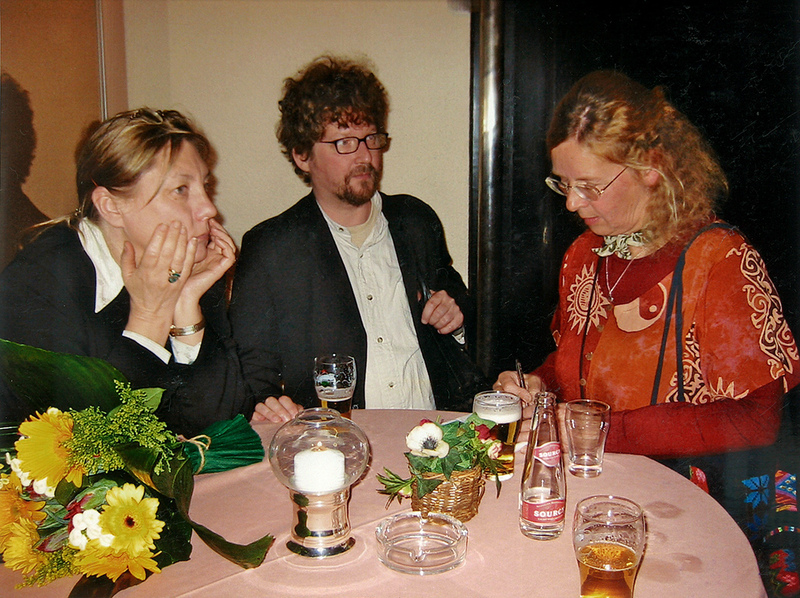 The major coincidence was the presence of Carsten Duffner, manager at Hessischer Rundfunk (Frankfurt RSO) who engaged Mark for the German première of the work (1st December 2006). Naxos release editor, Peter Bromley (also a productive Shostakovich expert), soon contacted Mark to make a world-première CD with them. This fitted in perfectly with the scheduled Frankfurt performance. The Naxos CD was released in 2008 to much critical acclaim. Geoffrey Paterson was a very productive and helpful assistant on all these projects. Mark conducted the Swiss première and other performances with Basel Sinfonietta in 2007, which was recorded with the encouragement of Nina Goslar (ZDF / ARTE) for release as a DVD and also features a bonus track of Shostakovich’s only fully surviving cartoon film, ‘The Silly Little Mouse’ (Opus 56). Peter Bromley (who by now had become a good and helpful friend and had also directly introduced Mark to Klaus Heymann, founder and head of the Naxos record label) took Mark with him to the DSCH Centre in Paris (20th November 2007) where Mark also met Emmanuel Utwiller, the very helpful director of the Paris centre, to present Mrs Shostakovich with some pre-release copies of the ‘Odna’ CDs. She was not only delighted with the CDs, but also delighted us when (without any warning) she presented us with more scores to prepare for première CD recordings as well as performances. The scores were of Shostakovich’s first (and very different) version of the opening movement of his Ninth Symphony (1945 and not quite complete). This score had ‘gone missing’ for over 50 years. The other score was a few sections which had been found for the film ‘Podrugi’ (‘The Girlfriends’ – 1935). We were delighted to accept this project (and celebrated with early Christmas mince pies and photos). The ‘Symphonic Movement’ was already fully scored by Shostakovich, with very sparse dynamic or phrasing marks, despite the very contrapuntal episodes and only a few errors. There is only one tempo indication of ‘Allegro non troppo’. Mark put in much thought as to how to bring out the full character of the work with minimum interference to the score. The world première of this work was conducted by Mark with the NPRSO in the Cracow Philharmonic Hall (30th August 2008). The ‘Podrugi’ film has 23 sections of music, 15 of which the manuscripts could not be found. 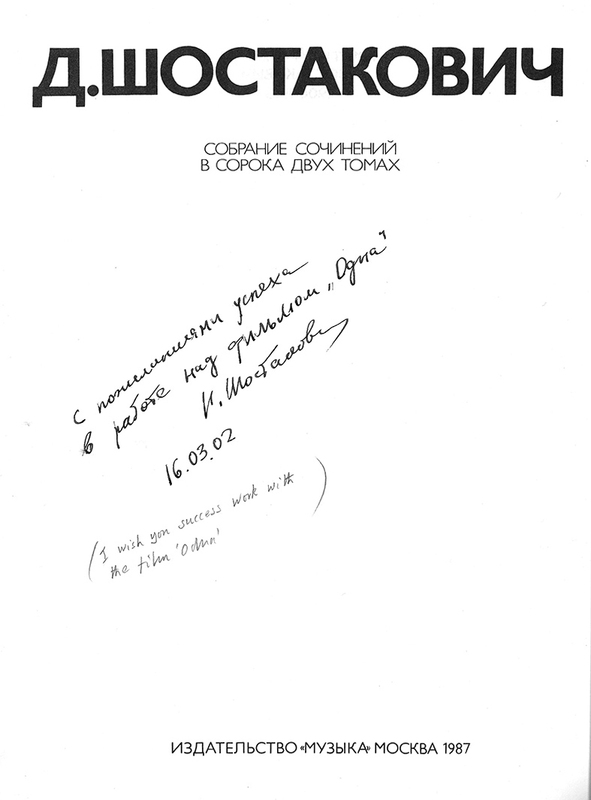 As with ‘Odna’ these sections had to be taken down by ear from the soundtrack, which was checked by Krzysztof Meyer, when Mark stayed with him and his wife in May 2008. There was also space on this CD to add two significant unheard theatre scores, ‘Rule Britannia!’ (Opus 28) and ‘Salute to Spain’ (Opus 34). Written in Shostakovich’s earlier period, they are both striking and original works. The DSCH Journal described Mark as ‘one of the indispensable Shostakovich interpreters of our time’ (2009). Another major Shostakovich score restored by Mark is in preparation for both publication and recording.